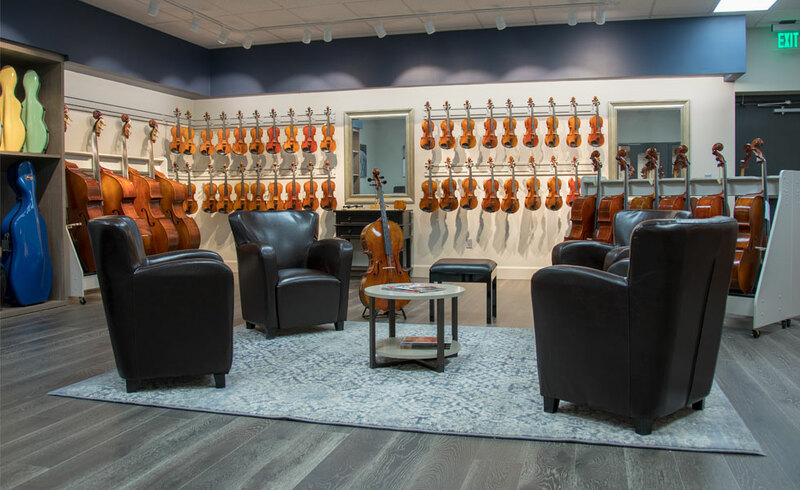 Welcome to the main showroom at Encore Orchestral Strings. This is the room where we showcase our intermediate and advanced instruments as well as bows, cases, and accessories. This is also where we keep John…although we do put him in the corner! From the relaxed seating area to instrument displays, everything has been thoughtfully considered with you in mind. We have many instruments at each price point so that a thorough comparison can be made before purchasing. The main showroom is also the home of our Encore rental program. With the exception of the electric instruments, every instrument in the main showroom is available on a rent-to-own basis. From rosin to rockstops, you will find all the string accessories you need as well as a few you might not have seen before. If you are looking for our most finely crafted instruments, please visit The Studio page.